I’ve been a full-time entrepreneur since 2003 along with Kerry Boyte, my wife. Since then we have created a series of amazing businesses and projects together. Some had moderate success – I remember when we were mentioned in the NYTimes and Time Magazine in the same year in 2005. When you’re a small-fry, that is a BIG deal and it infuses incredible energy and passion into your work. Hey, that stuff is important when you’re just one or two people in a room with a dream! I also remember when we were sued over trademark that same year. Not fun! We got our asses kicked, but came out OK and learned a lot. We have created everything from a job search engine to geo blogging platform to real-time analytics products together. In 2012 we launched Wordfence and the rest is history. Wordfence grew so quickly it was hard to manage the growth, but thanks to Kerry transforming herself into an incredible CFO we managed to keep our heads above water while investing heavily in the business. Today we are still married, still best friends and still absolutely loving what we do. Business is a lot more fun these days because we have an incredible team, customers who are passionate about our products and services and very strong cashflow which is, lets face it, the thing that lets us keep doing what we love with the amazing people we work with. Kerry and I made some major sacrifices while we grew the business. We could have easily raised multiple rounds of funding to survive and grow, but we avoided that and have managed to stay independent and in control of the business. We have also had multiple acquisition offers for Defiant from major public companies that you have heard of (some even have their own superbowl ads), and we have turned them down. Why? Because we love our independence and we love the freedom that gives us and our team. This sounds cliched but it is very real. 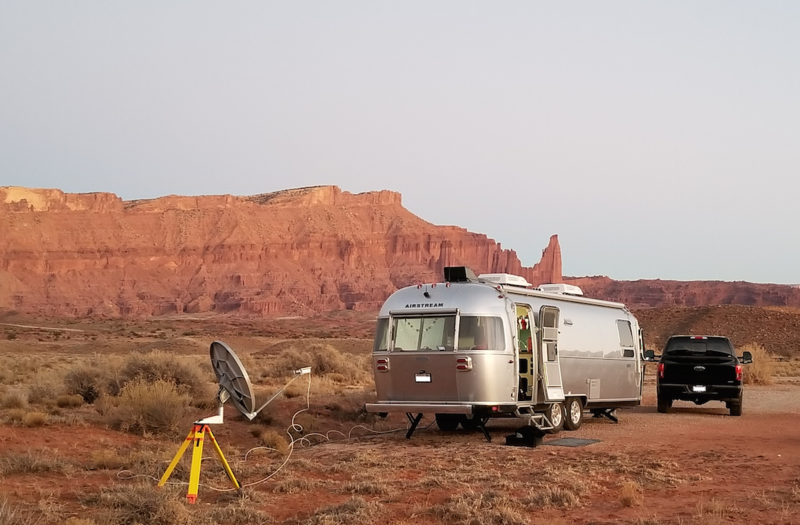 We all work remotely and some of our team, including Kerry and I, have satellite Internet and occasionally we go and park in the middle of nowhere, far from cellphone towers or wifi, and work and have fun. This is “Max” our trailer, in Utah over the holidays with Satellite Internet set up. Today Defiant Inc is of course the maker of Wordfence, the most popular security product for WordPress. We are completely independent and we are very good at what we do. With the recent spate of acquisitions, we have seen two of our major competitors acquired by hosting companies and we feel like the last company standing. In fact we find ourselves in the rather surprising position of being one of the few remaining major plugin or security vendors who is not owned by a hosting company. Sucuri was acquired by GoDaddy. iThemes (makers of iThemes Security) were acquired by LiquidWeb last week. Other major players like WooCommerce have been acquired by Automattic who is technically a hosting company with their WordPress.com business. ManageWP, a WP service provider was acquired by GoDaddy a while back and the list goes on. I have no doubt that the acquisitions will continue and that we will remain high growth with strong cashflow and fully independent. Hey, we are Defiant, after all! In my roughly 15 years of being a full-time entrepreneur, I’ve realized that business is hard and if you’ve invested everything you have and are a small business, it can be scary. It’s tough to find a metaphor to describe what Kerry and I have been through in life and in business. Perhaps “forged in the fires of Mount Doom” captures some of that experience. Someday I’ll write a book about it all – and you’ll probably be relieved to hear that today is not that day. This culture of innovation and being comfortable failing is something we have both brought with us into the larger organization that is Defiant Inc today. Kerry and I want our team to know that it is safe to experiment and it is safe to fail. Of course winning and succeeding is more fun and better for our customers, our business and our team. But failing is what truly makes you robust or ‘antifragile’. We have succeeded beyond our wildest dreams with Wordfence, and with the release of Wordfence 7 we have seen the business take a ‘stair step’ up in growth and in all our key performance indicators. About a year and a half ago we launched a project called “Gravityscan” which was an experiment in several ways. We literally invented new event-driven technologies to create a real-time browser based application that provided vulnerability and malware scanning. We launched the project and put some pretty heavy marketing behind it but to no avail. Gravityscan just never found a product-market fit. It never found a group of users who fell in love with it. We made changes to Gravityscan, added a viral model, focused on improving engagement and so on. But the world was telling us quite clearly that it didn’t want or need Gravityscan. Kerry and I have developed a kind of gut-feel for when a project is doomed, and we decided that Gravityscan had a decent shot and it was time to end the experiment and move on. And that’s exactly what we did. I started by getting each of the Gravityscan team members on the phone and explaining two things: 1) Why we think Gravityscan has had it’s shot at greatness and it’s time to call it. And 2) I shared an incredible vision for what we are going to do with the technology and team that becomes available once we decommission Gravityscan. In every case, by the end of the conversation, we were both really excited about moving on and starting work on – lets call it “newthing”. We don’t even have a code name for newthing yet, but it is something our customers have been asking for, for a very long time and we are going to give you what you want and go way further. So watch this space!! As we arrive in February of 2018, our vision for Defiant is crystal clear. We intend to focus 100% on the one thing we are good at: WordPress Security. We are doubling down on the WordPress market and focusing on gaining a deep understanding of what our customers want. And we will be delivering exactly that, with interest! The Defiant Inc team is as strong as ever. Our senior devs just got back from Shmoocon, one of the coolest hacking conferences in the world. Between you and me, a few of them teamed up and competed in a ‘capture the flag’ competition – which is basically a hacking contest – and actually did pretty darn well out of hundreds of contestants. We will be attending quite a few conferences this year and will be sponsoring several of them. We will also be recruiting for several roles this year. We have already opened the first role which is “Senior Operations Engineer”. If you are a golden ops goddess (or god), want to work with the coolest team in the business, want to meet up at DefCon every year, work from anywhere in the world and have the most badass looking business cards in the biz (Syndel our designer really knocked it out of the park!) then you should definitely visit our careers page. Most importantly, if you have not yet tried out the awesomeness that is Wordfence 7, download it now and secure your WordPress website!! You’ll notice that we have shifted our focus to security fundamentals. Wordfence 7 is tightly focused on securing your site with as little friction and distraction as possible. Out of the box, Wordfence does an incredible job of locking you down and giving you an overview of your security posture at a glance. Kerry and I and our team are looking forward to an incredible 2018 with you. Our team will be focused on securing your WordPress website and finding new ways to reduce your workload while improving your site security. Thanks for being a Wordfence customer and thanks for being part of Defiant!